Wearing strong colours well requires a lot of practice. The key is learning how to balance bright colours with darker, but equally strong tones. A purple handkerchief will stand out against a mid-grey flannel suit, but it will be restrained by a rich, dark and textured brown. As Francesco Maglia demonstrates here. Chino, as he is known, has been wearing these colours for decades and it has become second nature. 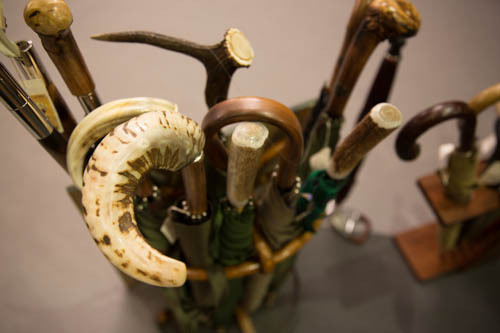 Heavy green tweeds, brown leather accessories, and strong colours such as the purple hank and mustard vest. Umbrellas, of course, are Chino’s trade. 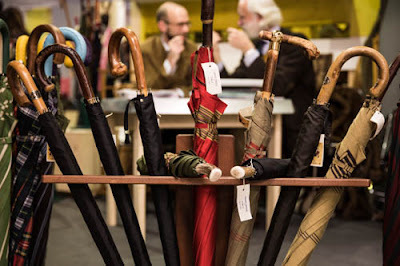 Maglia is the best large umbrella maker in Italy, the only peer being Talarico in Naples, who is much smaller. Maglia makes for most luxury brands under their own label – at least, most that care about quality and want something handmade out of a single shaft of wood. 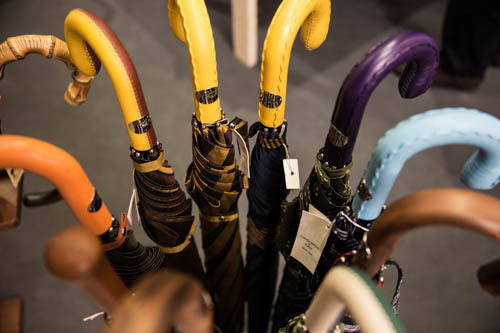 The materials are lacking because of the lack of good umbrella makers – most of Maglia’s competition has fallen away. 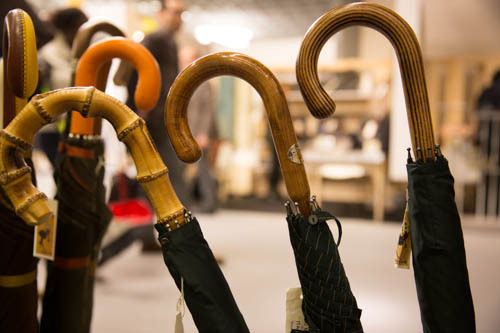 “The vast majority of umbrellas are made in China, where it costs 95 cents to make one. I pay 80 cents for the horn tip on each of my umbrellas,” he says. But back to style. Chino is known for his braided-leather braces and his collarless jacket, which is lined in a bright country check. And of course the Father Christmas beard. “It’s either Santa Claus or Giuseppe Verdi that I’m told I look like, depending on the country,” he says. With that hair styling, glasses round his neck and umbrella in hand, Chino could easily come across as an eccentric. It is a testament to the way he wears those colours that he does not. Chino is an abbreviation of Franceschino – a diminutive of his name, which is of course intentionally ironic, given that he’s six-and-a-half feet tall. 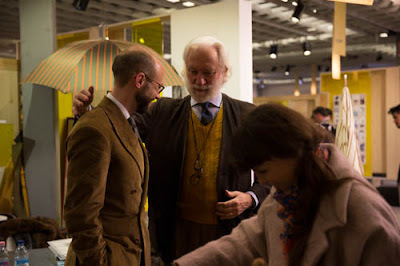 You can follow the discussion on The style of Francesco Maglia by entering your email address in the box below. You will then receive an email every time a new comment is added. These will also contain a link to a page where you can stop the alerts, and remove all of your related data from the site. Chino Maglia is simply the best ! 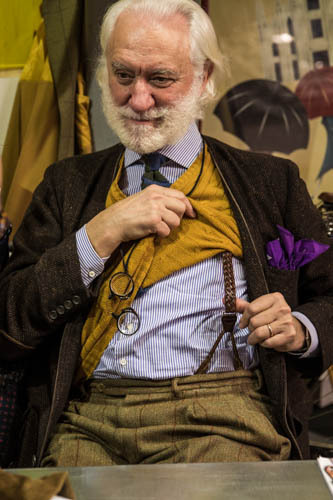 Interesting how Maglia, Luciano Barbera and many other Italian icons all draw inspiration from English style. We really need credit where it’s due! A living legend. I met him a few times, Chino is a 100% gentleman which is a rare phenomenon these days. It is a pleasure to do business with him for my company. I just met Francesco a few hours ago when I ran into him in a store in Germany. It was the first time I met him but we (or shall I say he) talked for about 2 hours! Really a great guy. Btw, he wore the same braces and trousers. Hi Simon. 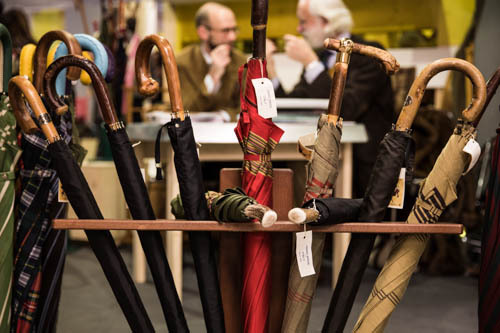 Do you know if a travel umbrella from Maglia Francesco could be mailed back to him for repairs ? Thanks. How do you find Maglias umbrellas to be, compared to Herthault and Fox ?